There are many foods that send a shudder up the spine of a food writer and educator. They tend to be truly inferior products, both nutritionally and taste-wise; but the American palate has become so accustomed to them that people have no desire to experience something better. At the top of our shudder list: processed American cheese. Children are taught to love it from their first gooey grilled cheese sandwich. But most “American cheese” so processed and packed with additives that it falls outside the legal definition of cheese. It may be comfort food, but it’s not good food. Trade in the inferior American cheese for real Cheddar slices. Photo courtesy Tillamook Cooperative. Processed American cheese contains 51% real cheese or less; the ingredients are emulsified and held together with artificial ingredients and preservatives. It has twice the salt found in natural Cheddar. America colonists brought their cheese-making skills to the New World and could make numerous types of cheese. But a single type won out: Cheddar. It was uniquely sturdy under primitive conditions and withstood seasonal variations in temperature and humidity, while delivering excellent flavor. The first cheese factory, enabling large-scale production, was built in 1851. When cheese is cut it in to blocks, there are leftover cheese trimmings. By the mid-1800s, an Ohio cheese maker named Emil Frey figured out how to heat his cheese scraps and add a few other ingredients to create processed cheese. This new cheese was more bland than Cheddar, which appealed to the [de-evolving] American palate. It turned velvety-smooth when melted, and became known as Velveeta. by Paul Johnson | IST. While some sources give credit for processed American cheese to James L. Kraft, who shredded and re-pasteurized Cheddar trimmings with sodium phosphate and patented “American process cheese” in 1916, he was not the first to create processed cheese. Others did it decades earlier. According to Chuck Blumer, who produces Spring Lake American Cheese another cheese maker other than Emil Frey decided to put the trimmings to good use by making a blended cheese. He threw all of his trimmings into the cooker, added some barrel Cheddar for consistency and sliceability, added some moisture (water) for meltability, and invented American cheese. All cheese makers followed suit, thrilled to turn their trimmings into profits. In 1885, Colby cheese was invented in Wisconsin by Joseph F. Steinwand, named for the township in which his father had built a cheese factory three years earlier. It is similar to Cheddar, but with some key differences in production. And like Cheddar, it was a hit. American cheese became a mix of Colby and Cheddar cheese scraps. With the surge in popularity of convenience foods in the 1950s, processed American cheese took off. The Baby Boomer generation grew up eating American cheese sandwiches: with lettuce and tomato, cold cuts or grilled with or without a slice of tomato. Says Blumer: American cheese became so popular that there were not enough trimmings to satisfy the demand. Cheese makers then shopped the world for any type of cheese they could buy at a cheap price. They would throw this cheap cheese in to the cooker with some cheddar and water to make their American Cheese. Most cheese makers still do this today. So, American cheese evolved from being quality trimmings of Cheddar and Colby to any cheap cheese that can be processed into a uniform flavor. 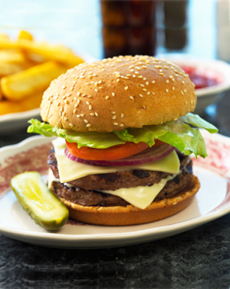 There’s hope for everyone who adds a slice of American cheese to a burger, sandwich or omelet. With Americans’ demands for more wholesome food, domestic Cheddar manufacturers have been making “American cheese” slices from 100% domestic barrel Cheddar. * And if you are making American cheese in Wisconsin, America’s largest cheese-producing state, you are required by law to use only 100% domestic barrel Cheddar in the production of American cheese. 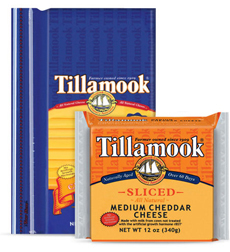 Look for Cheddar slices from Organic Valley, Tillamook and other quality Cheddar producers. Check out this infographic for the story of what you’re getting today when you buy Cheddar versus American Cheese. Find more of our favorite cheeses and recipes. *Barrel cheddar, or Cheddar barrel cheese, is a 500 pound barrels of cheese sold by cheese producers in to other manufacturers.